Nirinjan Kaur Khalsa and Matthew Schoening come to Dublin to share some musical bliss this Sunday, 14th September, 2014. Last year her track Triple Mantra went to the top of the UK spiritual charts, after appearing on Radio 4’s Desert Island discs, having been chosen by Russell Brand as one of his favourites. The workshop will begin at 1.30pm. 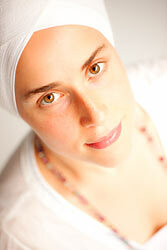 Nirinjan Kaur will share how to open our voice and heart to chant to the fullest, tuning into our highest self, opening the doors for our own creativity to flow and transform our lives. With live music and vocals from Nirinjan Kaur and Matthew Schoening. The concert will begin at 5pm, with Nirinjan Kaur’s smooth and heartfelt, yet powerful voice, and Matthew Schoening’s indelible cello, we will experience mantras and songs from the Sikh and Kundalini Yoga traditions. The music is taken to a profound depth of experience, transporting us to a place of complete stillness, experiencing the mystery and wisdom held within each note. We will open the doors of our hearts, and dive into the power of deep healing through mantra. Nirinjan Kaur was born in Vancouver, B.C. to a family of practicing Sikhs. Her mother, Guru Raj Kaur Khalsa, is also a kirtan artist, and had sung for years before Nirinjan’s birth. She studied under the tuteladge of Ustaad Narinder Singh whilst studying at Miri Piri Academy in India, learning Eastern music theory, along with how to sing from a deep place with a full voice. Matthew Schoening is a world reknown, award winning artist who plays his electric cello through a complex process of live looping. His music is admired globally, many incorporating it into their spiritual practice due to its depth and variety thats pleasing to the ear and soul.